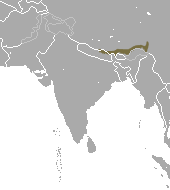 The Himalayan pika (Ochotona himalayana) is a species of small mammal in the pika family (Ochotonidae). It is found at high altitudes in remote areas of Tibet and possibly also in Nepal. The IUCN has listed this species as being of "least concern". The Himalayan pika was first described by Feng in 1973. Before that it was thought to by synonymous with Royle's pika (Ochotona roylei) and it is found wholly within the range of that species. However, molecular studies by Yu et al. (2000) confirmed that it was a separate species. There are no recognised subspecies. The Himalayan pika is native to the northern side of the Himalayas in the Tibet Autonomous Region in the Mount Everest area at altitudes of 2,400 to 4,200 metres (7,900 to 13,800 ft). There have been claims that it is present in Nepal on the southern side of the mountain range but this has not been authenticated. The typical habitat of this species is rocky places, screes, walls and cliffs in the vicinity of coniferous forests. The Himalayan pika is a small mammal about 17 cm (6.7 in) long and very similar in appearance to Royle's pika. It is particularly active early in the morning and again at nightfall and feeds on various types of plant material. It produces litters of three or four young. The Himalayan pika lives in remote mountainous areas where it has little association with man. No particular threats have been identified and the International Union for Conservation of Nature list it as being of "least concern". The IUCN advocates that more research should be undertaken on its ecology and population status. 1 2 3 4 5 6 Smith, A.T. & Johnston, C.H. (2008). "Ochotona himalayana". IUCN Red List of Threatened Species. Version 2014.2. International Union for Conservation of Nature. Retrieved 19 September 2014. 1 2 3 Hoffman, R.S. ; Smith, A.T. (2005). "Order Lagomorpha". In Wilson, D.E. ; Reeder, D.M. Mammal Species of the World: A Taxonomic and Geographic Reference (3rd ed.). Johns Hopkins University Press. p. 188. ISBN 978-0-8018-8221-0. OCLC 62265494.